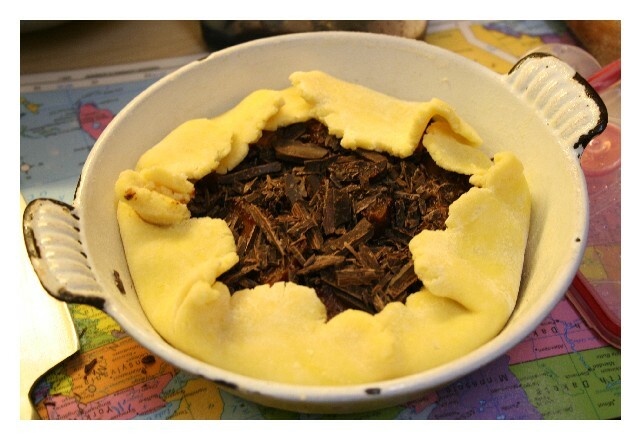 This basic recipe is one I use for all of my tarte and tourte crusts. The recipe below is enough for two small tartes that will serve four people one reasonable serving each, or one big one. If you want to make a larger tarte or multiple batches, you can multiply this recipe. You can make this pastry crust, refrigerate it, and use it the next day. The dough freezes well, for when you are preparing mass quantities for parties, but the pastry crust is so easy to put together, I don’t see the point in making more than you’re going to use each time. If you like a nice thick crust, sometimes it is better to give it a blast in the oven before filling it to ensure that it cooks through. 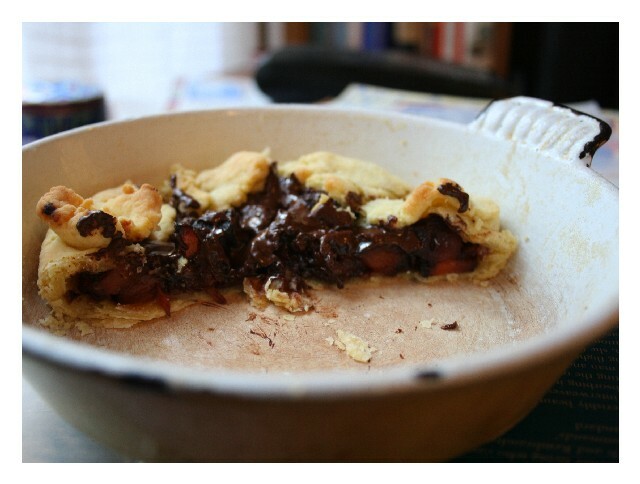 I use this recipe primarily for savory dishes, but it also goes well with anything chocolate. 70 grams butter or duck fat, depending on what you need to use up. 1 T. thick crème fraiche or a few drops of poultry stock, depending on what you have on hand and what you plan to fill it with. - Mix the flour and salt and make a well in the center. - Work the fat into the flour with a fork until it looks like crumbs. Add the yolk, and work it in. - Incorporate the crème fraîche or stock into the dough by teaspoon, stopping once it holds together. This is your pate brisée for savory tartes. - Place this in the fridge and find something to occupy your time for at least 1/2 hour before using it. When you're ready to use it, roll out the dough into a circle, keeping in mind that for a home made tarte, you have the choice to make it as thick as you like. What you want to do is roll it out to be just a bit bigger than a small pie shell, so that you can set it inside and have the edges fold over a bit. If you don't have a small shell, you can just as easily roll the crust flat and simply turn up the edges by pinching all around before pre-baking it. - Pre-bake this shell: Cover your rolled shell which you have place in the tarte pan with baking parchment and weigh down the middle with pastry beans and bake at 200C / 400F for 7 minutes (the pastry beans don't have to be used if you have rolled the shell flat). You don't have to pre-bake this crust if you don't want to, really. Follow whatever your recipe says, and when you have the time to try it another way, definitely experiment, and put it in your own kitchen notebook! Last night I used cold water instead of crème fraîche, adding just enough cold water to help pull the dough together. I did this because we didn't have any creme fraiche on hand. The crust turned out fine. This crist is wonderful to handle! It's in my refrigerator right now . . . I've made this three different ways now and loved it each time. The crust made with duck fat is the best! What is "1 T. thick crème fraiche"? Sorry Jurie, a T. would be a tablespoon. Note: you can also use sour cream in place of the creme fraiche with good results.